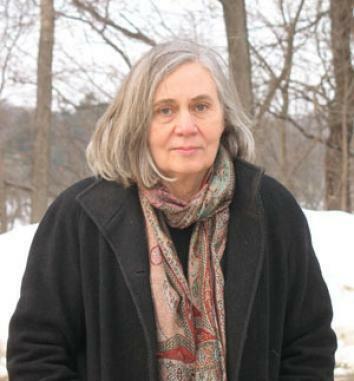 Marilynne Robinson flies higher and goes deeper into issues of faith and redemption in Lila. Marilynne Robinson, one of our finest writers of contemporary American fiction, is, to hear her tell it, something of an accidental novelist. Her first novel, Housekeeping, which appeared in 1980, began as a series of metaphors, an exercise she’d never planned to develop as a novel. Then, despite Housekeeping’s rapturous critical reception, she focused on nonfiction, eschewing the writing of further novels until, in the early 2000s, the voice of an elderly preacher came to her when she unexpectedly found herself alone for a few days during a trip. Out of this sojourn came Gilead, the story of the Reverend John Ames, pastor of a Congregationalist church in a small Iowa prairie town, father of a young boy and husband to a surprisingly young wife. In that first novel set in the hamlet of Gilead, as well as the second (2008’s Home), Lila Ames was a rough-edged, elusive figure, a mystery unresolved: Who was she and how did she come to marry the Reverend Ames? In Lila, Robinson’s deeply moving new novel, we at last come to know her and to witness the struggles of the Ameses’ most unusual love story, one shaped in no small measure by the questions Robinson has asked for her entire career: What is the meaning of suffering? Do any of us have hope of redemption? The novel traces the life of the indigent Lila from about the age of 5 in 1920 through her marriage to the elderly Reverend Ames and the birth of their son 30 years later. As she prepares for the child’s arrival, her thoughts eddy through her distant past as an itinerant farm worker during the great dust storms of the Depression and her subsequent years in a St. Louis brothel, but returning always to the gruff but loving woman, called Doll, who raised her. In the novel’s wrenching opening, we bear witness to Lila’s memory of herself as a girl shivering outside a backwoods cabin at night. Will it do her more harm or good if she howls to be let back in? “She couldn’t holler anymore and they didn’t hear her anyway, or they might and that would make things worse. Somebody had shouted, Shut that thing up or I’ll do it!” Treated worse than a stray dog, the girl doesn’t know who her family is, or even her own name. The same night she is rescued and carried off by Doll, a poor drifter who becomes like a mother to the girl, and names her Lila. The raw, chilling opening co-opts the reader’s sympathy so fiercely that at first it’s a disappointment when Robinson pulls back, offering little more of Lila’s early childhood. But of course the lives of small children are about bodies, brute physical survival—and Robinson has always been more interested in how we obtain spiritual sustenance. Lila is a novel of no small questions. “I just been wondering lately why things happen the way they do,” Lila observes to Reverend Ames, when, as a newcomer to Gilead—she’s taken up residence at an abandoned shack a few miles outside town—she stops by the widower’s house unannounced, to his alternating delight and embarrassment. He doesn’t fend very well with her question except to offer the tautological reply that life is a “very deep mystery, and that finally the grace of God is all that can resolve it. And the grace of God is also a very deep mystery.” But their awkward, searching conversations continue, composing a singular courtship during which they discuss her somewhat-accidental theological questions and she spontaneously suggests they get married. She is so uncomfortable with herself, consumed with a loneliness she both reveres and regrets, that she can barely stand to look other people in the eye. But in the Reverend she sees a kindred aloneness and a kindness she cannot refute. 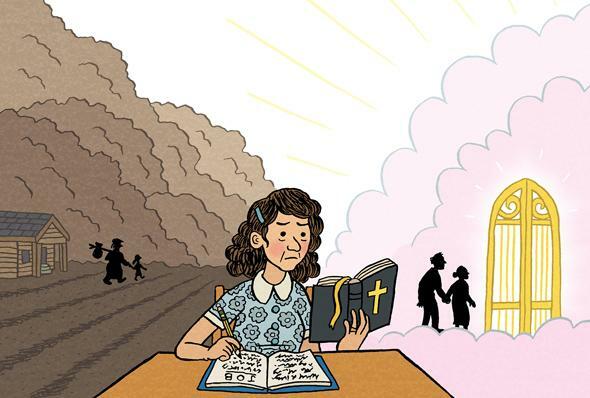 The book is punctuated by their earnest—often charming and funny—dialogues, in which they fumble toward better understanding themselves, each other, and how they feel about hoary doctrinal concepts like salvation and damnation. In the day thou wast born thy navel was not cut, neither wast thou washed in water to cleanse thee … No eye pitied thee. And she fell to thinking that somebody had to have pitied her, or any child that lives. I passed by thee, and saw thee weltering in thy blood. She is drawn to the violent, mythic imagery of Ezekiel, particularly one passage. She tries on its words and ideas, and overlays them with her own story. And I looked, and, behold, a stormy wind came out of the north, a great cloud, with a fire infolding in itself, and a brightness round about it, and out of the midst thereof as it were glowing metal, out of the midst of the fire … And out of the midst thereof came the likeness of four living creatures. And this was their appearance: they had the likeness of a man. And every one had four faces, and every one of them had four wings. Well, she didn’t know what to make of that. A dream somebody had, and he wrote it down, and it ended up in this book … Her name had the likeness of a name. She had the likeness of a woman, with hands but no face at all, since she never let herself see it. She had the likeness of a life, because she was all alone in it. She lived in the likeness of a house, with walls and a roof and a door that kept nothing in and nothing out. And when Doll took her up and swept her away, she had felt a likeness of wings. Robinson has said that she wrote Home because she felt “bereaved” at being separated from the characters of Gilead. It seems fortunate that her grief remained unspent after the final pages of the second book, its intensity instead propelling her through a third novel in what feels like—to borrow the register of Ezekiel—a tidal wave of emotion. Lila gives us Gilead life from a completely different vantage point, its outsider’s perspective casting little tremors of doubt back over events and actions contained in the prior novels. With its undiluted passion and earned affirmation of the human struggle—it’s no spoiler to say that Lila stays put with the Reverend, since Gilead finds the couple raising their by-then 7-year-old son—Lila is easily the richest and most satisfying in this triptych of masterly works. Photo by Kelly Ruth Winter. The voice’s seductions encourage us to submerge ourselves in Lila’s story and serve as guide and comfort through the novel’s challenges and complexities. Besides the rapid shifts in narrative distance and time frames and multiple peaks of action we experience as Lila fossicks through different eras of her past, the novel grows steadily in allusiveness and rigor as it goes, confronting us with no small selection of obtuse Old Testament verses, parables inside and alongside and underneath parables, allusions to Calvin, and rehearsals of inter-denominational arguments over eligibility for eternity. (Lila is gripped with fear that her beloved Doll, as an unbeliever, will be forever punished.) The fearsome storms, disturbing creatures, and condemnatory tone of the Old Testament verses may put Lila off, the Reverend fears. “You know, I wouldn’t mind if you were reading Matthew, along with Ezekiel,” he tells her. “Just a suggestion.” I wouldn’t have minded either. Matthew’s easy sailing. But Lila is not about ease, and despite its deep pleasures—its pellucid prose, its singular voice, its stealthy-sweet love story—reading the novel is far from easeful. The weft of the novel is so tight, so intricate, that the impatient or non-theologically inclined reader can hardly opt to skip over these irksome passages, with their archaic syntax, their infolding clouds and infants weltering in their blood. Making my way through Lila, I found myself thinking of a recent book that in its way made quite similar demands: Alison Bechdel’s comics memoir Are You My Mother? What Bechdel achieves with her layered storytelling and her panels within panels has a lot in common with Robinson’s cumulative effects. Both books require the reader to assimilate multiple information sources at once, and to engage a discourse that can feel foreign or alienating: Bechdel’s is psychological and Robinson’s theological, but either way we’re being forced away from our default modes of reading. Both works find a woman using borrowed language and metaphor to reframe the way she sees herself; both confront the basic pain of separation that defines the human. She kept thinking, What happens when somebody isn’t herself anymore? I seem to be getting used to things I never even knew about just a few months ago. … Maybe it’ll be something the old man liked about me that will be gone sometime, and I won’t even know what it was. She found herself thinking she might stay around anyway. She thought she’d always like the feel of him, she’d probably always like to creep into bed beside him. He didn’t seem to mind it. Lila by Marilynne Robinson. Farrar, Straus and Giroux.